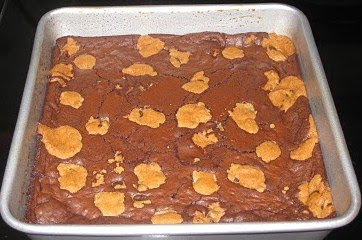 Half brownie, half chocolate chip cookie...how can you go wrong? As soon as one of my students brought these squares to school as a treat for her birthday, I immediately needed the recipe. Since I couldn't wait, I decided to create my own recipe. This is possibly the simplest recipe that I have ever made...it is also very delicious and very addictive! Pre-heat oven to 350 degrees. Spray 8 x 8" baking pan with cooking spray. 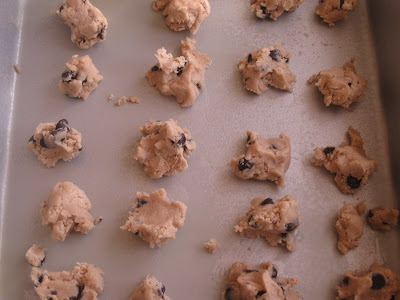 Split a log of Pillsbury cookie dough in half (as only half is needed for this recipe). Refrigerate or freeze other half. 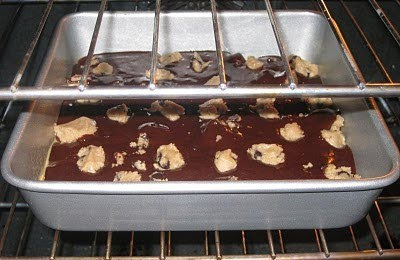 Break 1/2 log of cookie dough into small pieces and place 3/4 into the pan as seen above. Reserve 1/4 of the pieces for later. Don't worry about the size or shape of the dough because everything will blend together in the oven. In a large mixing bowl, combine all required ingredients to make brownies. 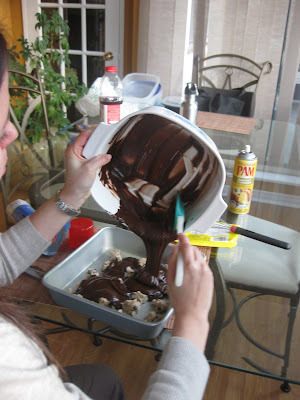 Or, if preferred, add eggs, water and oil to a store bought brownie mix. Pour brownie mix into pan over cookie dough. Top with remaining cookie dough. Bake at 350 degrees for 20-25 minutes. Let cool completely before removing from pan. Cut into squares and serve in mini muffin tins. I dare you to try not to eat any along the way. Don't tell Rich...I ate about six. They were so good! They also freeze well. Store in an air-tight container. Remove from freezer 2-3 hours before serving. That's too funny! 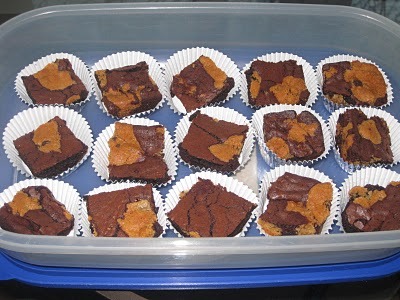 I made these for a Chanuka party using Bakerella's recipe...they were sooooo yummy! I thought her recipe was easy-peasy, but thanks to the log of cookie dough, your recipe is even simpler (I didn't think that was possible)! Yummy! I am going to make these very soon! I had to post one recipe for all of you who really want to make something from my blog but always complain that you can't because there are too many steps or too many ingredients. This is it! Take all of the credit and tell everyone that "you" made it!